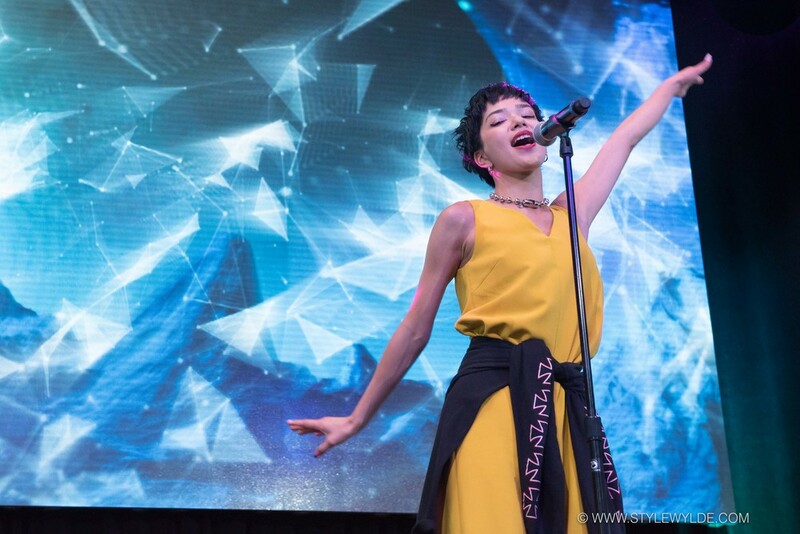 Harajuku street fashion model turned rising Japanese Pop star, Una returned the the SF Bay Area for a live performance at the 2016 J-Pop Summit Festival. We caught up with her for a quick chat on Saturday morning just before she took to the stage. SW: The last time we saw you, you were performing and modeling in the the Moshi Moshi Nippon fashion show. Organizers of that event explained that the show was meant to introduce Kawaii Culture to the US. It's been two years since that show, do you think Americans have a better understanding of Kawaii culture? Una: For me, it was a personal goal to show how Kawaii isn't just 'cute.' I think that Americans understand the cute Kawaii, but it's is actually a lot more than that, it can be a lot of different things. I am hoping to show the edgier side. SW: So we have a lot more to learn? Una: A little more, yes. Una: Like Fendi! Fendi is extremely inspired by Japanese fashion. SW: Fendi, and a few others. Let me show you a few photos (Ed: we gave Una photos from Jeremy Scott Fall 2015, as well as several other fashion shows) Does this look like Kawaii fashion to you? What do you think about that? Una: I think it's funny! I feel like whenever someone who is not Japanese wears Kawaii style with the pink and all the decora they always look like Barbie dolls! SW: Because of the blond hair and all the pink? I guess they do look like giant Barbie dolls. But is that a good thing? Una: YES! It's good, I think it is so cute. SW: What about the designers themselves, is it positive for Kawaii culture, and Japanese fashion that so many western brands draw inspiration from Japanese street style? Or do you think they shouldn't be doing it? Una: I think it's great for Japanese fashion, it shows how kawaii is spreading around the world. SW: Ok, so back to you. Last time you were here you were making a lot of stops in cities all around the world, what was your favorite place? Una: In San Francisco, or around the whole world? Una: In San Francisco, I loved shopping near Pier 39. I love the water, it's so pretty here. But it is always cold! I had to buy the jacket I am wearing last night because it's so cold and I didn't expect it to be, I am always cold in San Francisco. SW: Everyone always says that. What about the rest of the rest of the world? Where were your favorite places? Una: Around the whole world, I went so many places it's hard to choose. I went to Myanmar, that was beautiful. I also went to Singapore, I loved the food there, and the buildings were so tall, I couldn't believe it, but it was also very close to the equator so it was warm, and lush. I loved Singapore. SW: I am getting the feeling that you are a tropics kind of girl. Una: (laughing) Yes! I am from Okinawa, the tropics are my home. I love the beach and the sun and the ocean. SW: So how long will you be with us in San Francisco this time? Una: I will be here for four nights. I am happy because I will get to see a little more of the city this time, I want to see the Golden Gate Bridge and the "Full House" houses. SW: And, finally can you tell us what are you doing today at J-POP? Una: I am performing a few songs, and I am acting as an ambassador for the Brand Aeon, who have just released a special backpack inspired by the randesaru bags school children carry. SW: Do you think performing at the festival will be different this time? Una: Yes! the festival is so much bigger now. The venue itself is a huge upgrade, there are so many more people. I went to the Kyary Pamyu Pamyu show last night, it was packed and everyone was singing along. They knew all the songs! It was so inspiring, it was so inspiring, I definitely want to perform more in the US. SW: Are you planning a tour of your own? Una: Um, maybe? (laughing) maybe in five years. I need a little more time to get better! Images: Simon Whittle for Style Wylde. This interview was conducted via translator.